BOOK EXCERPT: Landcover data commonly forms the foundation for conservation planning. Used alone, it offers the potential to identify and conserve unique or rare plant communities but often are used as variables defining wildlife habitat across the landscape. Conservation biology has long relied on the idea that protecting habitat for surrogate wildlife species will protect habitat for other species with similar requirements, as in concepts of focal species (Lambeck 1997), umbrella species (Wilcox 1984), flagship species (Caro and O’Doherty 1999), and indicator species (Landres et al. 1988). Landcover derived habitat is often a primary component for defining core areas (Church, chapter 9) and connectivity habitat (Singleton and McRae, chapter 10) that subsequently forms the spatial basis for other conservation planning analyses, such as population viability (Stanton and Akçakaya, chapter 11), optimization (Williams, chapter 12), ecosystems services valuation (Chan et al. chapter 2), and predicted landcover response to climate change (Bachelet, chapter 13). Selection of landcover data is therefore a critical consideration affecting the entire conservation planning process. The intent of this chapter is to provide considerations about the selection and use of landcover data for delineating habitat as part of the conservation planning process. The focus is on the vegetative aspect of landcover. Vegetation is a strong, although complex, indicator of the ecological function of natural systems (Grossman et al. 1998). Nearly all animal life is in some way dependent on vegetation for food and shelter, and the influence of vegetation on water cycles and albedo (sunlight reflectance and adsorption) ultimately affects our global climate. Our ability to accurately characterize, map, and monitor the vegetation around us is fundamental for understanding the world we live in, assessing environmental issues, conserving biodiversity, and, ultimately, for conservation planning. Success in conservation planning relies on acceptance and implementation of our work. 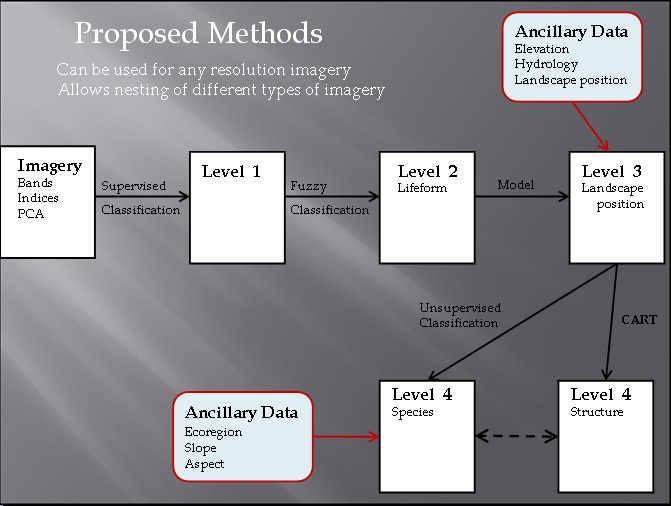 Because landcover data often forms the foundation of conservation planning, it is critical that limitations in data accuracy and precision are understood prior to its use and how these limitations affect results. Natureserve Ecological Systems: NatureServe and its natural heritage program members, have completed a working classification of terrestrial ecological systems in the conterminous United States, southern Alaska, and adjacent portions of Mexico and Canada. NatureServe has developed two, inter-related terrestrial classifications, the International Vegetation Classification (IVC), which provides a hierarchical ordering of vegetation around the globe, from broad formations or biomes to fine scale alliances and associations, and the International Terrestrial Ecological Systems Classification, which provides a single, mid-scale level unit suitable for classification and mapping of ecosystems at a scale relevant to many conservation and resource management applications. Vegetation Mapping (view larger) local-scale field-based vector vegetation mapping by the California Native Plant Society and Calif. Dept of Fish and Wildlife, based on the National Vegetation Classification System. Clicking on the point symbols yields the Natureserve ecological systems, Otherwise CNPS classes. This map explores how to interact with and visualize related ecological data at 2 different scales and created by 2 different methods, analytical and field. Yosemite Vegetation Map ; vegetation of Yosemite National Park and beyond the boundary. The data were produced from 1997 color infrared analog photographs flown by Photo Science through a nationwide contract. ESRI (Environmental Systems Research Institute) was the contrator that coordinated the work. Hundreds of vegetation plots were surveyed within the park and outside the park boundaries by the National Park Service, the U.S. Geological Survey, and The Nature Conservancy. The photointerpretation of the 1997 photos was performed by Aerial Information Systems (Redlands, CA).